Helmet Orange and White Neon SculptureI was worried before about how the Neon Sign will look and will it be the same I am expecting. All my worries got the way to be happy when I received it. Neon Sign for my Coffee Shop is looking superb. Thank you Everything Neon. My customers too are loving it. 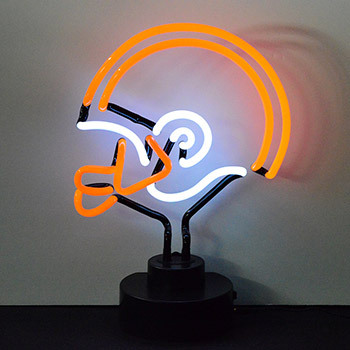 A great way to express your love for the noble game of pool, the Helmet Orange and White Neon Sculpture brings a cool and mesmerizing vibe to your home decor. Perfect for your living room, game room or den, this wonderful free-standing neon sign is sure to add character to your living space. This fluorescent sculpture features skillfully hand blown neon tubing, a silent and efficient solid state transformer, and an on and off switch for convenience. A captivating piece of neon art, it comes fully assembled; no wiring required. Made of glass, metal, plastic and electronic components. Assembly level/degree of difficulty: No Assembly Required.